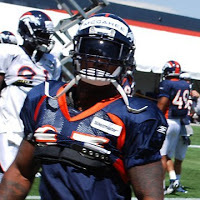 The Denver Broncos on Thursday announced that veteran running back Willis McGahee has been released. McGahee (31, 6'0", 235 pounds) is an 11-year veteran and would have been entering his third season with the Broncos. After skipping team OTAs, McGahee saw his first-team reps divvied up to second-year running back Ronnie Hillman and rookie Montee Ball. "I knew it was going to happen," McGahee told ESPN's Josina Anderson. "It is what it is. They are going younger." After a strong first season in Denver in 2011 when he rushed for 1,199 yards, McGahee's age began to show last season when he fumbled five times before suffering a torn right MCL and right lower leg fracture, which ended his 2012 campaign. “It’s never easy to part ways with a veteran player who made so many positive contributions to our team and community,” team executive John Elway stated via the team's official Twitter account. "I wish him the best as he continues his NFL career," concluded Elway. It shouldn't be hard for McGahee to land on another team at the very least in a rotational role. McGahee signed a four-year, $9.5 million deal with the Broncos in 2011. He had two more signing bonus payments of $500,000 due to hit the Broncos' salary cap in 2013 and 2014, which will result in a $1 million dead money hit after the release. According to Spotrac.com, the Broncos currently have $7,838,635 in dead money. That's a mark-off of the available $123,000,000 2013 salary cap. McGahee was originally owed $2.5 million in 2013 and $2 million in 2014, while his bonuses will count against the cap, those base salaries will not, freeing up a total of $4.5 million for Denver. In his career, McGahee has rushed for 8,097 yards and 63 touchdowns after being drafted in the first round of the 2003 NFL draft by the Buffalo Bills. Before joining the Broncos, McGahee also spent time with the Baltimore Ravens, sharing the load with Ray Rice for four years. With Hillman and Ball emerging and Knowshon Moreno returning once he recovers from a knee operation, the Broncos certainly are going younger at running back—Denver's backfield trio boasts an average age of 22.6 years old. With Moreno still recovering from surgery, Hillman is the write-in starter as of now. Once Moreno returns, he will likely win the job back. Returners Lance Ball and Jacob Hester will also see time in Denver's backfield rotation. By midseason, expect Ball to be carrying the load. Eventually, it will be Ball's backfield.